Long before David Chang, Grant Achatz, Ferran Adria, Alice Waters, and Nancy Silverton; ages before molecular gastronomy, convenience foods, tapas menus, and contemporary tasting menus; and ages before restaurants became entertainment and chefs were viewed as celebrities – there was Escoffier. Many chefs had and continue to have an impact on what we eat and how it is prepared, but none, to this date, have had the impact on our profession to the level of Escoffier. He is to the culinary world what Bach is to the world of music. In both cases they refined the foundations of their craft in such a manner as to become the benchmark for generations of artists since. Every contemporary cook or chef owes a great deal to the foundations of Escoffier and with rare exception, what they do in kitchens today began with their study of those foundations. To become an accomplished cook requires that each individual culinarian learn about the standards of excellence that Escoffier built into his kitchens. This does not begin and end with cooking techniques, his contributions go way beyond the application of methods to a recipe or technique; his most significant contributions are in how he operated within the kitchen domain. The kitchen brigade was refined and clearly defined by Escoffier. These foundations were reflective of his time in the French military as a cook for the leadership of those fighting in the Franco/Prussian War. He noted the efficiency with which the military operated, the separation of responsibilities and the unifying methods used to communicate and bring a task to fruition. It is this organization and level of communication that became the essence of how an Escoffier kitchen would function. His department chefs: Rotissier, Garde Manger, Patissier, Entremetsier, Saucier, Potager, Boulanger, and Poissonier had very specific duties and held a level of expertise that was uniquely strong within those disciplines. The people who worked for them would be trained and pushed to develop those skills so that they might eventually hold that position themselves. To this end, there was always teaching and training taking place and a constant funnel of new talent moving up the ranks. It was a self-sustaining human ecosystem that allowed the standards of Escoffier to never waiver. He was the consummate leader and manager because his system was tuned into achieving excellent results. Escoffier was a disciplined cook, a masterful menu planner, and a polished ambassador for the kitchens and the properties where he worked. He built his brand long before it became the science that it is today. He did not have a marketing firm helping to polish his image; he did this on his own with the assistance of Caesar Ritz – his front-of-the-house counterpart. People knew who Escoffier was, marveled at his food, and respected him at a time when this was not the norm. He was most likely one of the original star chefs. Escoffier was also a practical man who simplified many of the age-old methods of cooking and plate presentation. He was an advocate for ensuring that everything on a plate have a purpose, that each ingredient marries with the desired flavor profile, and that all components are something that people would want to eat. He discounted the ancient style of service that required all courses to be presented simultaneously and instead promoted service a’la russe (service by course). This helped to maintain the temperature and integrity of each course in due order and helped the chef to reduce waste, thus improving the potential for profit. Finally, Escoffier was committed to documenting his work in the kitchen and as a result produced references that others still follow, at some level, today. Le Guide Culinaire, although somewhat antiquated in its procedures and ingredients, sits on most accomplished chefs bookshelves. The 5,000 recipes contained in this encyclopedia of classical cooking continue to stand as one of the most impressive cooking compendiums of all time. We may not prepare the dishes that Escoffier kept in his arsenal, but we are, and will continue to be, directly or indirectly influenced by his efforts. In the early 1990’s I had the privilege of visiting the home of Escoffier (now a museum) in Villeneuve Lobet, France. This quaint Mediterranean village was made famous by this favorite son. Within the walls of this mecca for cooks lie the menus, tools, recognitions, pictures, and articles that chronologically follow his life in the kitchen. In a corner of the second or third floor of his village home sits the desk of Escoffier. 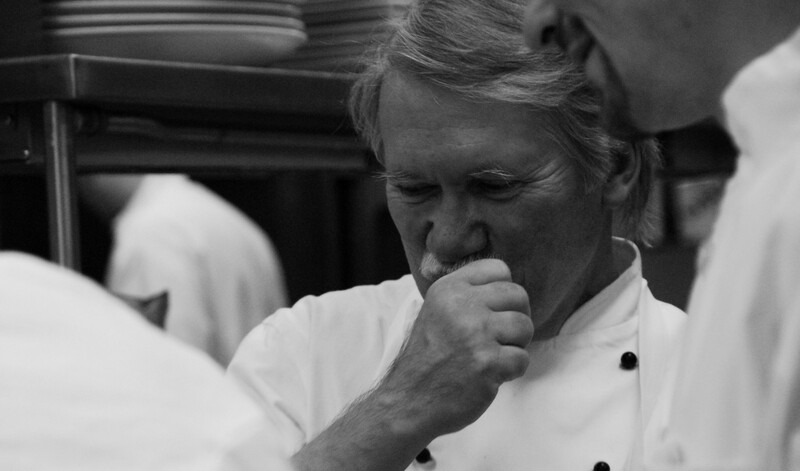 I placed my hands on the desk and could, for that instant, feel the magic of a chef who defined our industry and raised the bar so high that others would only attempt to reach those heights for generations to come. There was electricity that I could literally feel rushing up through my hands and my arms, it was real; it was a feeling of energy that has stayed with me for nearly 25 years. It may sound absurd, but to me it was real. This is the chef that inspires me, the person who I want to emulate in terms of how to approach the operation of a kitchen, the connection with staff, and the commitment to serving guests. We may all have our bucket lists of restaurants to visit and chefs to meet, we may, as professionals, seek to connect with contemporaries who are doing remarkable things with food – this is important. But, I would encourage everyone to put a visit to the Escoffier museum at the top of his or her list. Go back to the roots of classical cooking technique and functional operation of a kitchen. Be inspired by Escoffier and know that each of those contemporaries who we admire owes a great deal to him. Note the following link to the Escoffier Museum as well as a link to a book of his memoirs. And in 1975 the week of Escoffier menus I did as chef and co-owner of Chez Panisse . Introducing him, Le Guide Cu;inaire, and his food to Panisse staff and all its customers.